I have been typing GEOS-3586 a lot of times this past week. The DDS/BIL plugin written for Geoserver 2.0.x had fallen by the wayside as things had changed on the WMS MapProducer(Response) front. This time it is going to be a serious push to get the plugin promoted from community module to extension status. I still need to get my head around GSIP-27 and GSIP-22 to efficiently continue maintaining this module. Finally I was recommended to just keep trunk updated and work towards getting the module moved out of community into extensions space. The DDS/BIL module has indeed a special place since it is the only community module extending map respones, all other map reponses are part of core. The extensions in response are mostly in the WFS area (OGR, Excel etc.). get even into the picture. The class that parses bgcolor is ColorKvpParser. breaking the proper error reporting mechanism in other cases. is using (use the raw kvp map to check the format and bgcolor values). in the most unexpected ways, or just ignoring what they set). I am also planning to include WorldWind (in an applet form) as a 3D layer preview tool in Geoserver alongside Openlayers. Chris Holmes floated this idea a while back. Since I will be doing lots of work on WorldWind anyway, I can practice browser integration on the side in Geoserver. The plugin has some primitive documentation now as well - hacked together with my basic look-and-learn Sphinx-fu. Talking about putting things together - I finally migrated the content from my old blog into this one. Now just need a way to redirect all the posts to duplicates here and just keep the blog being deleted one. My shiny new BeagleBoard-xM arrived a few days ago. I have been too snowed in with OSGi to spare it some time. The test image on the supplied SD card boots fine, but I have grand plans for a slamming robot vehicle which will require more goodies (probably eventually ros). It has become even easier to get started with kinect and beagleboard thanks to the inclusion of libfreenect master in angstrom. It can be almost plug and play. Install non-ramdisk angstrom. From windows the easiest way to get started is to download and SD image Koen graciously provides and burn it on top of the test image supplied with the board. As expected a few hiccups with the image writer but nothing a downgrade would not fix. Install libfreenect directly (opkg install libfreenect) or grab git/cmake etc. to build from source. Even when building libfreenect from source, having libfreenect-dev installed is handy since it fetches all the other headers needed. Make an OpenCV based demo, the standard demos don't work so well because the Beagle video driver lacks GLX. Need some more packages opencv, opencv-dev, compilers and whatever else. The building required a few symlinks for compilers and opencv libraries since I was compiling on the beagle itself rather than cross-compiling from oe. My TinCanTools xM trainer board with its Arduino will be arriving soon. The idea is to get a couple of servos and probably even a mobile robotics platform to start building an indoor track and shoot platform, with some slamming and co-operative map building thrown in. 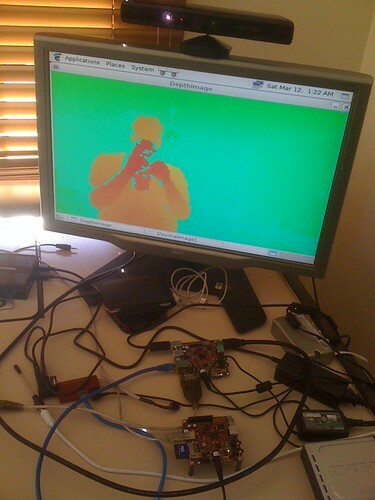 If anyone is interested in building a GLES client for the Kinect on the BeagleBoard let me know.